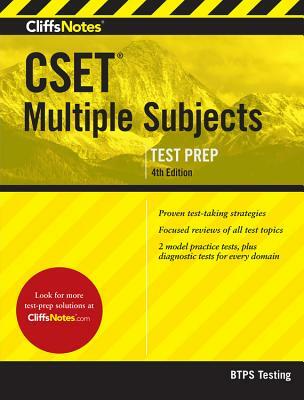 Common Core meets California's CSET Multiple Subjects exam in this revised CliffsNotes CSET Multiple Subjects test-prep product. Given California's adoption of the Common Core State Standards, their revising the CSET Multiple Subjects exam means CliffsNotes' revising this test-prep study guide. The exam, consisting of multiple-choice questions and constructed-response questions, is computer-based and can be taken anytime during the year. This 4th edition test-prep study guide includes subject-review chapters and two model practice exams.